The solution to the challenge published a few days ago can be found here. Wikipedia provides more details on the allocation. At Isabelle’s request, I agreed to attend Simon Bennett’s session on The Prisoner’s Dilemma: Applying Game Theory to Agile Contracting. Before getting into the content of the presentation, I must say that after recently reading slide:ology: The Art and Science of Creating Great Presentations, Simon’s visual presentation was outstanding. It has been a while since I attended a presentation with such quality visual material – too bad I can’t link to it. Through a series of games, Simon demonstrated how traditional software development contracts are not appropriate for Agile projects and since I don’t have his legal (Corporate Law) or Economics (Behavioural Economics) background, I will quickly jump to the games that were played during the session. If you are not already familiar with this game, here are the basic rules. More information about this game can be found on Wikipedia. Requirements: Two people are required to play this game. Scenario: The two of you have been arrested with regards to a crime. You are both kept in isolation for interrogation and have no way of communicating with each other. How to win: In order to be released from prison, both of you need to say that your accomplice is innocent. Rules: If one of you says the other person is guilty, the innocent person walks away while the guilty person stays in prison. If both of you say you are guilty, you both stay in prison. While the optimal scenario would be that both of you say you are innocent, chances are you (and most probably your accomplice) will say the other person is guilty in an attempt to be released from prison. Unfortunately, this behavior leads to the worst case scenario which has both of you staying in prison. This game is interesting and demonstrates why contractual agreement has the potential to results in an optimal deal but leads most of the time to the worst possible scenario. If you are not already familiar with this game, here are the basic rules. Requirements: Five people are required to play this game. Scenario: As a group of pirates, you have just found a chess than contains 100 gold pieces. How to win: The objective of each of the pirate is to maximize the number of coins they will receive and the decision to split the coin is democratic – each pirate gets to vote and the majority (or tie) proposition will be accepted. Rules: Each pirate has a seniority level – pirate A is the most senior pirate while pirate E – the fifth pirate – is the most junior pirate. In order of seniority, each pirate proposes to the group how he wishes to split the coins and then asks everyone (including himself) to vote on the proposal. 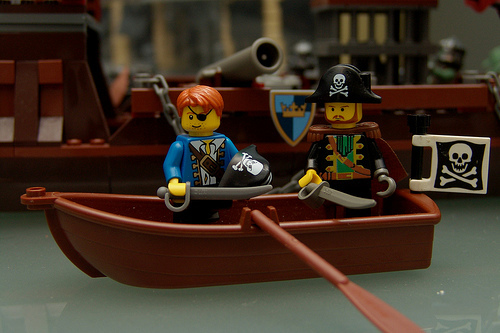 When a proposal receives 50% or more of the vote, it is then accepted BUT if the proposal receives less than 50% of the votes, the proposing pirates is thrown overboard to the sharks. While pirate A would wish to keep the 100 coins, there is no way for him to make this proposal without being thrown to the sharks. His challenge then becomes how to please other pirates in order to keep as many coins as possible, without risking his life. Go ahead and try this game to see what happens. The solution to the game can be found in this post that will go online on September 8th. I unfortunately do not have the documentation (and permission) to share the details of the bidding game but the conclusion are once again very obvious. People trying to maximize their compensation or reward always leads to less than optimal and sometimes to the worst possible outcome for both parties. As is stated in the Agile Manifesto – “Customer Collaboration over Contract Negotiation” would almost always give better results than aiming to maximize individual rewards. Unfortunately, our irrational (and sometimes greedy) nature doesn’t allow the maximum outcome to be reached. During a break from the exhibit hall, I had the opportunity to attend the presentation given by Rich Sheridan, CEO of Menlo Innovations called “Don’t Sell Buzzwords to Business Leaders, Learn How to Describe Real Value“. Although I was disappointed at first because the presentation actually didn’t have anything to do with “Buzzwords” and “Business Leaders”, I quickly changed my impression once Richard started to describe his company’s culture and the way he leads his organization. As I already mentioned, our organization operates very differently from most organizations and in an attempt to adapt the right organizational structure I’m reading as many books, articles and blogs on this topic – including Maverick: The Success Story Behind the World’s Most Unusual Workplace (thanks to Andrew Meyer for the reference). You can understand my interest once Richard talked about making similar organizational choices as we did: complete transparency, no formal hierarchy, accountability towards your team instead of a boss, well developed recruitment process, equitable compensation, open work environment, etc. Menlo Innovations has published a book that demonstrates how their way of operating does deliver the real value as expected by their customers. I have ordered the book since it wasn’t available on site and I will certainly provide my assessment of it once I receive it. Needless to say, the presentation captured the interest of most of the people in the room and many were hoping to have lunch with Richard after the presentation to better understand his unusual work environment. Unfortunately for me, my break was over and I had to get back to the booth. I will obviously continue my research on this topic.